The program seems to promote some kind of high society theme party at the opulent Waldorf-Astoria Hotel in New York City. 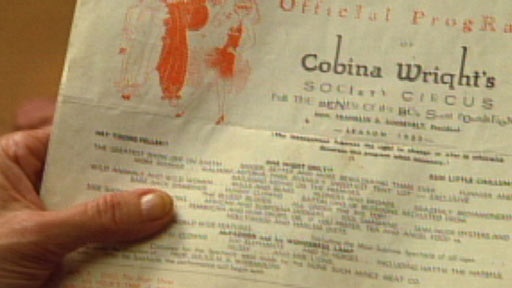 Who was Cobina Wright and what do the Boy Scouts, FDR and Cobina’s Circus -- with its lengthy “who’s-who” celebrity list have in common? History Detectives explores New York City’s 1930s high society and illuminates a connection between FDR and the Boy Scouts that inspired one of the most popular and effective pieces of the President’s New Deal program. Also with Gwen Wright Home of Lincoln Assassination Plot Did the plot to assassinate Abraham Lincoln begin in this New York City building? Related Investigation Coney Island Lions Could this be an artifact from the bygone days of early amusement parks? Also in Season 9 Yakima Canutt's Saddle What leading role did this saddle play in the birth of the Hollywood cowboy? Related Investigation First Movie Studio Could a broken gateway once have been the grand entrance to a Hollywood studio? Also in Depression and WWII: 1929-1945 WWII Patch What is the story behind these patches?